Having lost to the Athletics in the 1930 World Series, St. Louis was looking for revenge in 1931. 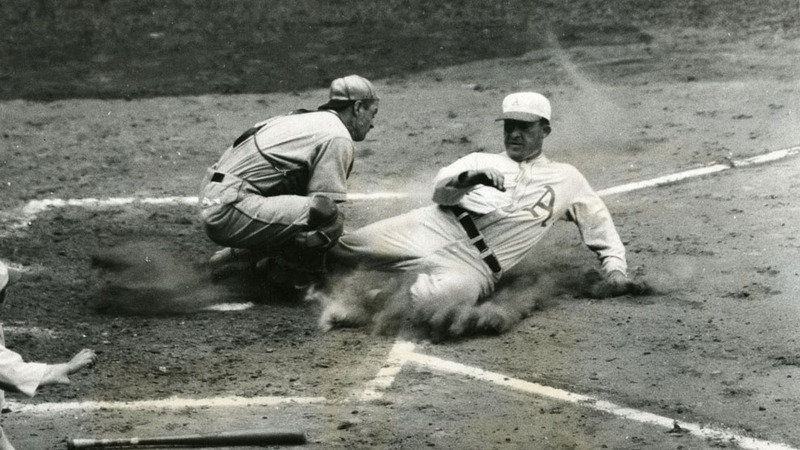 And though the Cardinals touched A's ace Lefty Grove for a dozen hits in the opener, they had problems stringing many of them together and could thus manage only two runs, both of them in the first inning. Meanwhile, Al Simmons drew a bases-loaded walk in Philly's four-run third, and in the seventh he drove a two-run homer deep into the right-field bleachers, making the final score A's 6, Cards 2. Game 2 went to the home-team Cardinals, Wild Bill Hallahan tossing a three-hit shutout to beat 1930 Series hero George Earnshaw, 2-0. After two days off -- one for travel, one for rain -- the World Series resumed in Philadelphia, Grove facing St. Louis spitballer Burleigh Grimes, who was brilliant. The Cardinals led 5-0 after scoring once in the ninth, while the A's didn't collect their second base hit until two were out in the bottom of that frame, when Al Simmons hit a two-run homer to make the final score 5-2. Game 4 was Earnshaw's turn to toss a two-hitter, as he topped the Redbirds 3-0 and evened the Series at two games apiece. Game 5 went to St. Louis, thanks to the solid pitching of Hallahan and a great game from center fielder Pepper Martin, already enjoying a great Series. Hallahan allowed but one run, and Martin went 3-for-4 with four RBI, two of them coming on a two-run homer in the sixth. The final was 5-1, Cardinals. Back in Philadelphia for Game 6, Grove mastered the Cardinals for an 8-1 triumph, the A's scoring four runs in the fifth and four more in the seventh. In Game 7, the Cardinals jumped on Earnshaw for two runs in the first inning, and they added two more in the third when George Watkins homered over the right-field pavilion. That was all St. Louis would get, but thanks to Burleigh Grimes it was all they would need. The A's didn't score until the top of the ninth, when pinch-hitter Doc Cramer's two-out single drove in two runs. With runners on first and second, Hallahan was summoned from the bullpen, and he retired Max Bishop on a fly to center field, ending the game (4-2) and the Series (4-3).